Carey Boiler Works LLC offers fast and dependable mobile boiler rental services, specializing in portable boiler rental, emergency rental boilers and temporary steam rental boilers, firetube or watertube rental boilers to the following states: North Carolina, South Carolina, Georgia, Tennessee, Kentucky, Alabama and Florida. A sampling of the locations we serve with temporary rental boilers include Charlotte NC, Raleigh-Durham NC, Greensboro NC, Winston-Salem NC, Fayetteville NC, Wilmington NC, High Point NC, Greenville NC, Asheville NC, Columbia SC, North Charleston SC, Rock Hill SC, Greenville SC, Atlanta GA, Augusta GA, Columbus GA, Savannah GA, Macon GA, Memphis TN, Nashville TN, Knoxville TN, Chattanooga TN, Clarksville TN, Louisville KY, Lexington-Fayette KY, Bowling Green KY, Birmingham AL, Montgomery AL, Mobile AL, Huntsville AL, Tuscaloosa AL, Jacksonville FL, Miami FL, Tampa-St. Petersburg FL, Orlando FL, Tallahassee FL and many more. Portable boiler rentals range in size from 20 HP to 82,500 PPH. Mobile steam boiler rental and hot water rental boilers are available. 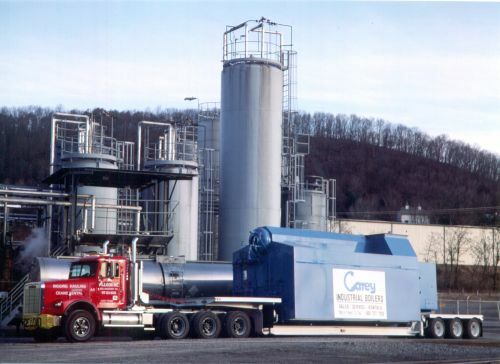 Temporary boiler rentals are available for low pressure (15 psi or less) and high pressure (up to 750 psi) applications. Industrial rental boilers are capable of firing on a variety of fuels. Emergency boiler rentals are available to ship 24 hours a day; 7 days a week. Utilize local industrial boiler representatives, when possible, to perform start-up and training of on-site personnel for the operation of the rental boiler. Need Help? Contact 1-800-727-7252 or complete the form below! !